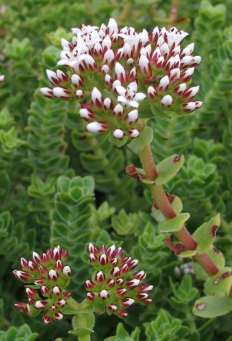 Crassula dejecta has decorative, fresh green foliage and showy white summer flowers, a good ground cover for the water-wise garden and a rewarding potplant. Crassula dejecta is a neat, densely branched, upright perennial shrublet, 400 mm tall. The leaves are slightly fleshy, often tinged red, with a row of rounded, bead-like hairs on the margins that give the leaves a silvery edge but which one needs a magnifying lens to see properly. There are also small downward-pointing hairs on the young branches that give the stems a silvery dusting and which one also needs a magnifying lens to see properly. The leaves are opposite, more or less the same length on the whole plant, and arranged densely in neat rows up the stems, giving a tidy, geometric effect. The flowers are white, sometimes tinged pink, with red sepals, red ovaries that colour the centre of the open flowers red, and red anthers that age to brown. The flowers are carried in flat to round-topped, tight clusters at the ends of the branches during midsummer (Dec.-Feb.) and are honey-scented. The flowers develop into small capsules, each holding many tiny seeds. Crassula dejecta is not threatened. It is listed as a cultivation escapee in the northern North Island of New Zealand. The genus Crassula is one of the most diverse succulent genera, varying from tiny moss-like annual plants to 2 m tall, succulent trees such as C. ovata. 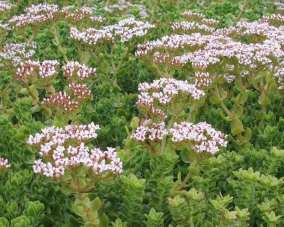 There are more than 300 Crassula species of which approx. 150 are found in southern Africa where they are widespread but concentrated in the semi-arid, winter rainfall areas. The centre of distribution of this genus is in southern Africa, but they extend beyond Africa into Europe, America, Australia, New Zealand and the southern islands. Crassula dejecta is found growing on south- or southwest-facing slopes or in kloofs, on rock outcrops, on ledges or in rock crevices from the Riviersonderend Mountains to near Stellenbosch in the Western Cape, northward through the Cederberg as far as Springbok in Namaqualand, Northern Cape. It is found in both the Fynbos and Succulent Karoo Biomes. The name Crassula is the diminutive of the Latin crassus, which means thick or fat, referring to the fleshy nature of the genus as a whole. The Latin dejectus, -a, -um, means downcast, dismayed, subdued, dejected or drooping, hanging, cast down or low. But according to Stearn (1992), the botanical meaning of dejecta is debased, from the Latin dejectionem, meaning throw down or force down or cause to fall or let fall. I cannot find the reason why this species earned this name; it could be from the downward curving hairs on young stems, or because the specimen named by Jacquin was found growing on an overhanging ledge or had to be thrown down from a ledge. Crassula dejecta was named in 1805 by Baron Nikolaus von Jacquin (1727-1817), professor of botany and chemistry and director of the botanic garden of the University of Vienna. Crassulas have an extraordinary metabolism known as Crassulacean Acid Metabolism or CAM that allows them to photosynthesize normally without losing much water through their leaves; this gives them the ability to survive and thrive in dry regions or areas that experience recurring droughts. All plants need CO2 (carbon dioxide) for photosynthesis. Most plants take in CO2 during daylight hours through their stomata (pores in the leaves) and can't avoid losing water at the same time through these open pores. In Crassula the stomata are closed during the day but open at night so that when they take in the CO2 they lose the least amount of water. 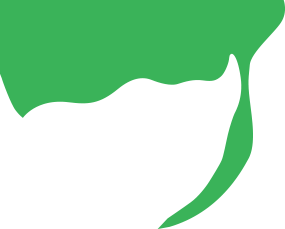 The CO2 taken in at night is stored in the form of organic crassulacean acids. During the day, these acids are broken down and the CO2 is released and re-used in the photosynthetic process. In this way they lose much less water yet can photosynthesize normally during the daylight hours. Furthermore, during extremely dry periods they won't even open their stomata at night, and will recycle the CO2 within the cells. They won't be able to grow at all but the cells will be kept healthy, a process known as CAM-idling. 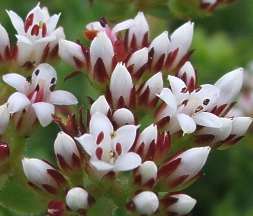 There is no record of Crassula dejecta being used medicinally, although some other Crassula species are used in traditional medicine, or as charms. Crassulas are easy to grow and Crassula dejecta is no exception. It does best when planted in well-drained soil, and fed with well-rotted compost and frequent low doses of organic fertilizer. Do not over-water. It does well in sun, or semi-shade and can be grown in a position that is light, as in open to the sky, but may only get direct sun for a short part of the day e.g. on the south or southwest side of the house. 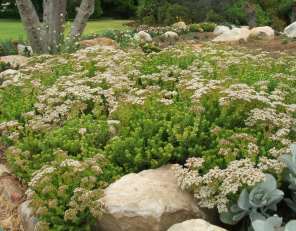 It makes an excellent water-wise groundcover if planted en masse. It forms a neat little bush that looks good on the edge or near the front of borders and in mixed plantings, and is perfect for the water-wise garden, fynbos garden, and in rockeries. It also makes an attractive container plant and can be grown on the windowsill or indoors where it gets bright light. Crassula dejecta is easily propagated by seed or cuttings. Being a plant from the winter rainfall region, seed is best sown in autumn, but it will germinate if sown in spring or early summer. Sow on the surface of a well-drained, sterile medium or sprinkle seed with clean coarse sand in a thin layer on the surface of the sowing medium. Keep moist and well ventilated.Cuttings can be taken at any time of the year and they root easily without the need for misting, bottom heat or even rooting hormones. They can be rooted in a well-drained medium in a cold-frame, or planted directly where they are intended to grow - in the Cape this is best done during autumn. Kesting, D. 2004. Wild flowers of the Cape Peninsula. Botanical names: origin and meaning. Flora Documentation Programme, Friends of Silvermine Nature Area, Muizenberg, Cape Town. Le Roux, A. 2005. 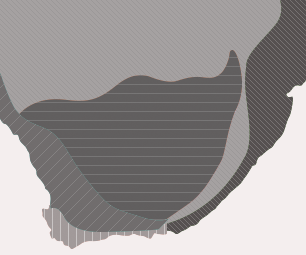 Namaqualand.South African Wild Flower Guide 1, edn 3. Botanical Society of South Africa, Cape Town. Stearn, W.T. 1992. Stearn's dictionary of plant names for gardeners. A handbook on the origin and meaning of the botanical names of some cultivated plants. Cassell, London. Tölken. H.R. 1977. 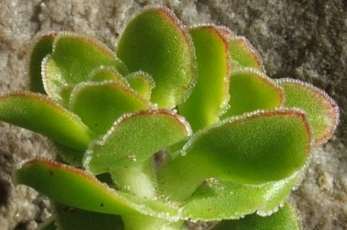 A revision of the genus Crassula in southern Africa. Contributions from the Bolus Herbarium No. 8. Bolus Herbarium, University of Cape Town.